Every season I tell myself that I won't go to LFW. It's stressful, shows run over and make me late, and there's always an after party where I get a little bit too drunk and regret it in the morning. However, I just can't help the excitement when the tickets land on my desk; what will this season's trends be like? Who will be walking the runways? Will I find a new design house to fall in love with? In the end, I give in to my curiosity, pop my heels on and grab my camera ready for the week ahead. This time, however, I chose just one day on which to attend so that I could keep stress levels to a minimum and leave my weekend free. 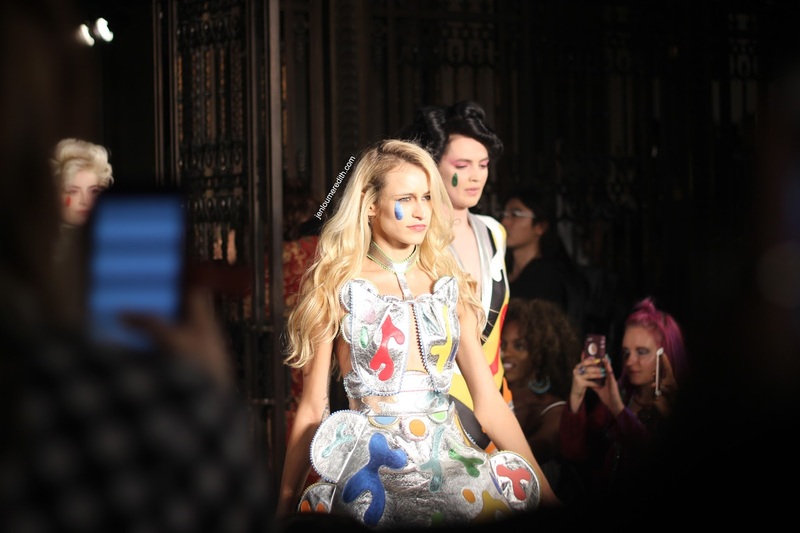 On Friday 16th September, Rocky Star, Paul Costelloe and Pam Hogg were showing, along with Fashion Scout's 'Ones to Watch' show, an assembly of rising talent within the industry (this year's catwalk saw Ana Ljubinkovic, Anissa Aida, Billie Jacobina and Ester Kubisz making their LFW debuts). Rocky Star's gowns were nothing short of breathtaking. His Bollywood-inspired designs showcased delicate floral applique on floating chiffons and silks, intricate necklines and showstopping headpieces. 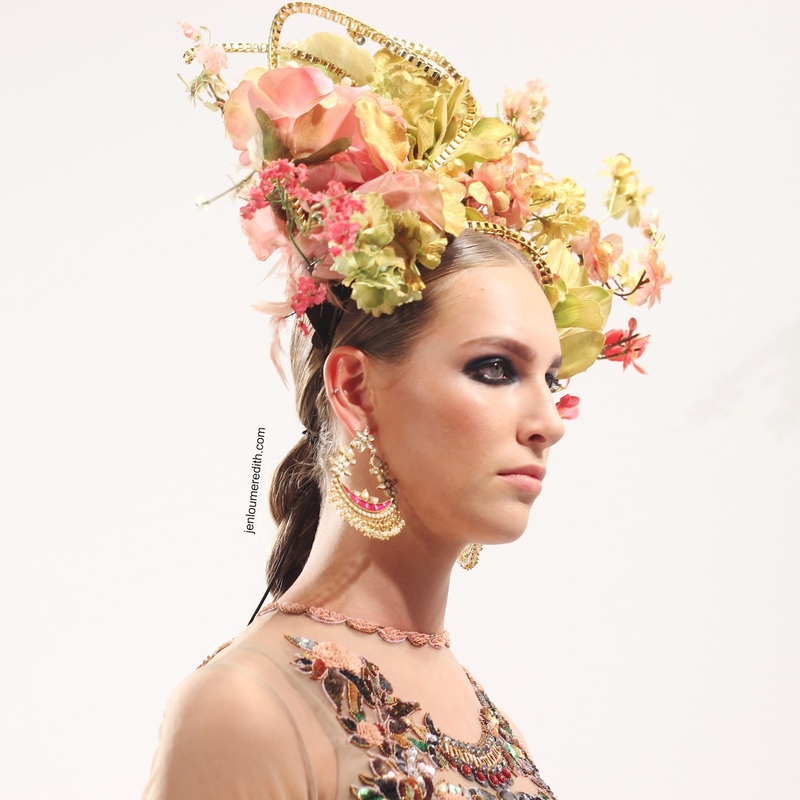 The models wore ornate and, often, oversized drop and chandelier earrings - some with the additional bejewelled choker - and the makeup focused on dark eye shadows, groomed brows and natural lips. Hair was tied back into low ponytails, then plaited in a simple braid. I loved the whole show. Despite the heavy ruffling, these dresses would certainly fit in well in my dream wardrobe. The colour palette was heavenly, and makes me nostalgic for a moment in time circa 2003 when all I wore was nudes, browns and dusky pinks; however, this is far, far better. As I had priority access to the show, I managed to get a half decent seat; however, I longed to get an up-close look at the dresses, so as soon as the show ended I went to the side of the catwalk and snapped a few photos of the models up close. The fabrics were so beautiful; I could liken them to the delicate surface of a painting. And the applique was just stunning: beads, jewels, sequins, coins, all sewn so deliberately on the fabric in perfect lines and patterns. 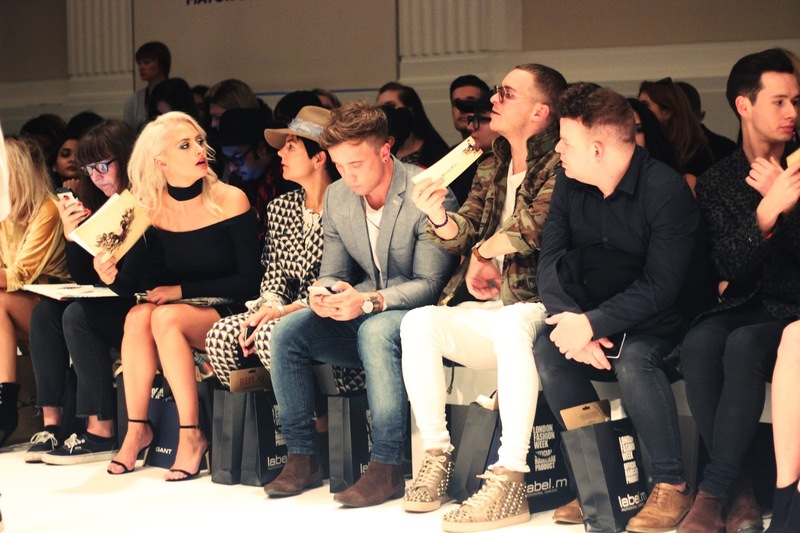 Also in attendance were Geordie Shore's Charlotte Crosby, Made In Chelsea's Nicola Hughes and Kimberley Garner, Love Island's Olivia Buckland, actresses Lily Frazer and Natalie Anderson, and singer Hatty Keane. Pam Hogg's show was, as usual, wacky as ever. 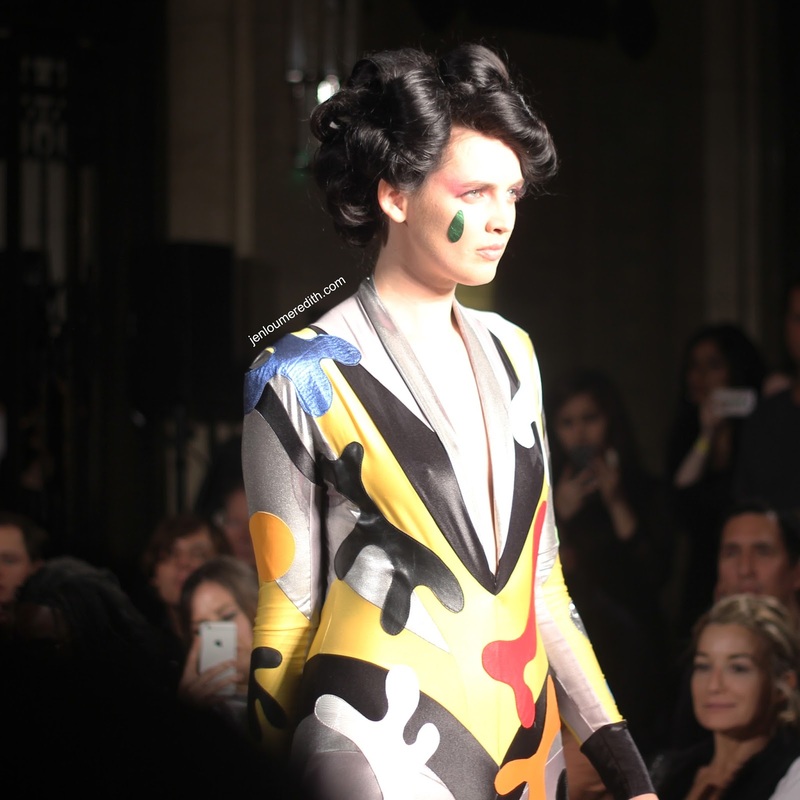 Her collection consisted of sixties-inspired block colours and shapes, combined with seventies metallics and wigs. There were, of course, several of the designer's famous bodysuits in both mesh and patent fabrics, alongside some extremely wearable pieces including a fiery orange playsuit that gave off a spiced-up Velma Dinkley vibe. Alice Dellal opened and closed the show in two different tea dress-style outfits, accessorised with huge platform heels and her signature undercut. Pam Hogg herslef made an appearance midway through the show, walking out in a gold tracksuit, aviators and cane, pointing to her friends on the frow as she went, and again at the end to thank everyone. All in all, an amazing show which definitely gave me an inkling that the sixties is going to be big next season. Thank God I still have a use for my mum's vintage mini skirts. Note: never throw anything away.